A novelization (or novelisation) is a derivative novel that adapts the story of a work created for another medium, such as a film, TV series, comic book or video game. Film novelizations were particularly popular before the advent of home video, but continue to find commercial success as part of marketing campaigns for major films. They are often written by accomplished writers based on an early draft of the film's script and on a tight deadline. Novelization of chapter 8 of the film series Les Vampires (1915–16). 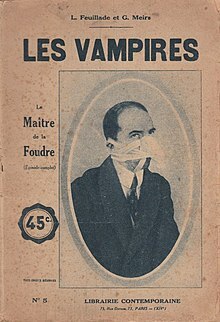 Novelizations of films began to be produced in the 1910s and 1920s for silent films such as Les Vampires (1915–16) and London After Midnight (1927). One of the first talking movies to be novelized was King Kong (1933). Film novelizations were especially profitable during the 1970s before home video became available, as they were then the only way to re-experience popular movies other than television airing or a rerelease in theaters. The novelizations of Star Wars (1977), Alien (1979) and Star Trek:The Motion Picture (1979) sold millions of copies. Even after the advent of home video, film novelizations remain popular, with the adaptation of Godzilla (2014) being included on The New York Times Best Seller list for mass-market paperbacks. This has been attributed to these novels' appeal to fans: About 50% of novelizations are sold to people who have watched the film and want to explore its characters further, or to reconnect to the enthusiasm they experienced when watching the film. A film is therefore also a sort of commercial for its novelization. Conversely, film novelizations help generate publicity for upcoming films, serving as a link in the film's marketing chain. According to publishing industry estimates, about one or two percent of the audience of a film will buy its novelization. This makes these relatively inexpensively produced works a commercially attractive proposition in the case of blockbuster film franchises. The increasing number of previously established novelists taking on tie-in works has been credited with these works gaining a "patina of respectability" after they had previously been disregarded in literary circles as derivative and mere merchandise. The writer of a novelization is supposed to multiply the 20,000–25,000 words of a screenplay into at least 60,000 words. Writers usually achieve that by adding description or introspection. Ambitious writers are moreover driven to work on transitions and characters just to accomplish "a more prose-worthy format". Sometimes the "novelizer" moreover invents new scenes in order to give the plot "added dimension", provided they are allowed to do that. It might take an insider to tell whether a novelization diverges instead unintentionally from the finally released film because it is based on an earlier version which possibly included meanwhile deleted scenes. Thus the novelization occasionally already presents material which will later on appear in a director's cut. Writers select different approaches to enrich a screenplay. Dewey Gram's Gladiator, for example, included historical background information. Shaun Hutson refused to write a novelization of Snakes on a Plane because he found the source material too "poor". Still Christa Faust accepted and filled the pages by inventing detailed biographies for some of the early killed passengers. She was then praised for having presented "full three-dimensional characters". If a film is based on a novel, the original novel is generally reissued with a cover based on the film's poster. If a film company which holds the rights for a film wishes to have a novelization published, the company is supposed to approach in the first place an author who is in possession of "Separated Rights". A writer has these rights if he contributed the source material (or added a great deal of creative input to it) and if he was moreover properly credited. Novelizations also exist where the film itself is based on an original novel: novelist and screenwriter Christopher Wood wrote a novelization of the James Bond film The Spy Who Loved Me. Although the 1962 Ian Fleming novel was still available in bookstores, its story had nothing to do with the 1977 film. To avoid confusion, Wood's novelization was titled James Bond, The Spy Who Loved Me. This novel is also an example of a screenwriter novelizing his own screenplay. Star Wars: From the Adventures of Luke Skywalker was published under the name of George Lucas but his script had been novelized by the prolific tie-in writer Alan Dean Foster. Acquiring editors looking for a novelizer have different issues. For starters rewrites of scripts are not uncommon. The script for the 1966 film Modesty Blaise for example was rewritten by five different authors. The writer or script doctor responsible for the so-called "final" version is not necessarily the artist who has contributed the original idea or most of the scenes. The patchwork character of a film script might even exacerbate because the film director, a principal actor or a consulting script doctor does rewrites during the shooting. An acquiring editor who intends to hire one of the credited screenwriters has to reckon that the early writers are no longer familiar with the current draft or work already on another film script. Not every screenwriter is available, willing to work for less money than what can be earned with film scripts and able to deliver the required amount of prose on time. Even if so, there is still the matter of novelizations having a questionable reputation. The International Association of Media Tie-In Writers concedes that by saying their craft went "largely unrecognized". Some novels blur the line between a novelization and an original novel that is the basis of a film adaptation. Arthur C. Clarke provided the ideas for Stanley Kubrick's 2001: A Space Odyssey. Based on his own short stories and his cooperation with Kubrick during the preparation and making of this film adaptation he wrote the film novelization of the same name which is appreciated by fans because the film provides little exposition, and the novelization fills in some blanks. David Morrell wrote the novel First Blood about John Rambo, which led to the film adaptation of the same name. Although Rambo dies at the end of his original story, Morrell had a paragraph in his contract stipulating he remained "the only person who could write books about Rambo". This paid off for him when the film producers changed the ending and decided for a sequel. David Morrell accepted to carry out the novelization and negotiated unprecedented liberties which resulted in an likewise unprecedented success when his book entered The New York Times Best Seller list and stayed there for six weeks. Simon Templar or James Bond are examples of media franchises that have been popular for more than one generation. When the feature film The Saint was released in 1997 the creator of this character (Leslie Charteris) had already been dead for four years. Hence its novelization had to be written by another author. Ian Fleming on the other hand had official successors who wrote contemporary "Post-Fleming" James Bond novels. During his tenure John Gardner was consequently chosen to write the novelization of Licence to Kill in 1989 and also the novelization of GoldenEye in 1995. John Gardner found his successor in Raymond Benson who wrote besides several original Bond novels three novelizations including The World Is Not Enough. While comic books such as the series Classics Illustrated have often provided adaptations of novels, novelizations of comic are relatively rare. Video games are novelized in the same manner as films. While gamers might enjoy playing a certain action scene for hours, the buyers of a novelization might be bored soon if they merely read about such a scene. Consequently, the writer will have to cut down on the action. Novelization writers are often also accomplished original fiction writers, as well as fans of the works they adapt, which helps motivate them to undertake a commission that is generally compensated with a relatively low flat fee. Alan Dean Foster, for example, said that, as a fan, "I got to make my own director's cut. I got to fix the science mistakes, I got to enlarge on the characters, if there was a scene I particularly liked, I got to do more of it, and I had an unlimited budget. So it was fun". Writing skill is particularly needed for challenging situations common to writing novelizations of popular media, such as lack of access to information about the film, last-minute script changes and very quick turnaround times. Max Allan Collins, for example, had to write the novelization of In the Line of Fire in nine days. Although novelizations tend to have a low prestige, and are often viewed as "hackwork", several critically acclaimed literary authors have written novelizations, including Arthur Calder-Marshall, William Kotzwinkle and Richard Elman. Best-selling author Ken Follett early in his career also wrote a novelization. While increasingly also a domain of previously established novelists, tie-in writing still has the disadvantages, from the writers' point of view, of modest pay, tight deadlines and no ownership in the intellectual property created. The International Association of Media Tie-In Writers is an American association that aims to recognize the writers of adapted and tie-in fiction. It hands out annual awards, the "Scribes", in categories including "best adapted novel". Episodes of Star Trek were adapted into short stories by the noted science fiction writer James Blish. Each volume of the stories included a number of the short story adaptations. Alan Dean Foster would later adapt the follow-up animated series into the Star Trek Log series. Mel Gilden wrote novelizations of Beverly Hills, 90210, merging three episodes into one book. As he explained, this approach required him to look for a joint story arc. In the early 1970s Lee Falk was asked by the Avon publishing house to deliver Phantom novels based on the eponymous comic strip. Falk worked on the novelizations on his own and with collaboration. A dispute over how he would be credited led to the cessation of the series. Peter O'Donnell, who scripted the Modesty Blaise comic strip, later authored novels featuring the character not directly based on the stories presented in the strips. Matt Forbeck became a writer of novels based on video games after he had been "writing tabletop roleplaying game books for over a decade". He worked also as a designer of video games. S. D. Perry wrote a series of novels based on the Resident Evil video games and added tie-ins to the novelizations, covering all the mainline titles in the series up until Resident Evil Zero. Eric Nylund introduced a new concept for a novelization when he delivered a trilogy, consisting of a prequel titled Halo: The Fall of Reach, an actual novelization titled Halo: First Strike and a sequel titled Halo: Ghosts of Onyx. Project Itoh, the Japanese author who novelized Metal Gear Solid 4: Guns of the Patriots, had plans to adapt Metal Gear Solid 3: Snake Eater and Metal Gear Solid: Peace Walker as well, but was unable to fulfill this due to his death in 2010. Satoshi Hase (author of Beatless) was commissioned to novelize Snake Eater in Itoh's place, while an anonymous author working under the pen name Hitori Nojima (later revealed to be Kadokawa Shoten writer Kenji Yano) novelized Peace Walker and Metal Gear Solid V: The Phantom Pain, in addition to new novelizations (unrelated to the earlier Raymond Benson versions) of the original Metal Gear Solid and Metal Gear Solid 2: Sons of Liberty. In some cases an otherwise standard novel may be based on an unfilmed screenplay. Ian Fleming's 1961 James Bond novel Thunderball was based on a script he had co-written; in this case his collaborators subsequently sued for plagiarism. Peter O'Donnell's novel Modesty Blaise was a novelization of a refused film script. In this case the creator of the main character had written the script alone. But later on other authors had changed O'Donnell's original script over and over, until merely one single sentence remained from the original. The novel was released a year before the film and unlike the film it had sequels. Frederick Forsyth's 1979 novel The Devil's Alternative was based on an unfilmed script he had written. Occasionally a novelization is issued even though the film is never made. Gordon Williams wrote the script and novelization for producer Harry Saltzman's abandoned film The Micronauts. ^ a b Jones, J. R. (November 18, 2011). "You've seen the movie—now write the book". The Chicago Reader. Retrieved March 28, 2013. ^ a b c d e f Suskind, Alex (27 August 2014). "Yes, People Still Read Movie Novelizations ... And Write Them, Too". Vanity Fair. Retrieved 28 August 2014. ^ a b Kobel, Peter (April 1, 2001). "To Some, a Movie Is Just an Outline for a Book". The New York Times. ^ a b c "David Morrell on Rambo". Retrieved March 28, 2013. ^ a b Alter, Alexandra (4 January 2015). "Popular TV Series and Movies Maintain Relevance as Novels". The New York Times. Retrieved 18 January 2015. ^ a b "The Tie-In Life by Raymond Benson". Retrieved February 1, 2011. ^ a b "Snakes on a Plane". Retrieved March 28, 2013. ^ "Film to Book Adaptations". Retrieved March 28, 2013. ^ Barry, Rick (February 12, 2012). "Review: The Novelization of Disney's John Carter". ^ "Theatrical Separated Rights". Writers Guild of America, West. Archived from the original on February 11, 2013. Retrieved April 13, 2013. ^ Britton 2005, p. 149. ^ a b Gilden, Mel. "Are Novelizations the Scum of Literature?". Archived from the original on December 1, 2008. Retrieved March 28, 2013. ^ "What is a Tie-In Writer?". Retrieved March 28, 2013. ^ "License to Kill". Retrieved March 28, 2013. ^ "Goldeneye". Retrieved March 28, 2013. ^ "Gardner, Benson & Bond". January 26, 1995. ^ Griffin, Bob; Griffin, John (December 5, 1999). "The Son of the Phantom (1944–1946)". The Deep Woods. ^ Pringle 1998, p. 119. ^ Hamilton & Jones 2009, p. 198. ^ Shatzky & Taub 1997, p. 79. ^ Turner 1996, p. 172. ^ "Lee Falk: Father of The Phantom". Retrieved March 28, 2013. ^ Forbeck, Matt (July 22, 2010). "How to Write a Tie-In Novel". The Escapist. ^ Kojima Productions [@KojiPro2015_EN] (June 13, 2016). "Just so you know; the "Hitori Nojima" from whose name is at the end of the trailer is actually our friend Kenji Yano" (Tweet) – via Twitter. ^ "Kevin McClory, Jack Whittingham and Ian Fleming". Retrieved March 28, 2013. ^ "Modesty Blaise Trivia". TCM. Retrieved March 28, 2013. ^ "Modesty Blaise Trivia". IMDB. Retrieved March 28, 2013. ^ Nathan, Paul S. (1975). "Rights and Permissions". Publishers Weekly. 207 (Part&nbsp, 2): 28. ^ anonymous (September 1977). "Bits & Pieces". Starlog (8): 16, 30. Britton, Wesley Alan (2005). Beyond Bond: Spies in Fiction and Film. Praeger. ISBN 0-275-98556-3. Hamilton, Geoff & Jones, Brian (2009). Encyclopedia of American Popular Fiction. Facts on File. ISBN 978-0-8160-7157-9. Pringle, David (1998). St. James Guide to Horror, Ghost & Gothic Writers. St. James Press. ISBN 1-55862-206-3. Shatzky, Joel & Taub, Michael, eds. (1997). Contemporary Jewish-American Novelists: A Bio-critical Sourcebook. Greenwood Press. ISBN 0-313-29462-3. Turner, Richard Charles (1996). Ken Follett: A Critical Companion. Greenwood Press. ISBN 0-313-29415-1. Baetens, Jan (2007). "From Screen to Text: Novelization, the Hidden Continent". In Cartmell, Deborah; Whelehan, Imelda. The Cambridge Companion to Literature on Screen. Cambridge: Cambridge University Press. pp. 226–38. Baetens, Jan (2005). "Novelization, a Contaminated Genre?". Critical Inquiry. 32 (1): 43–60. doi:10.1086/498003. ISSN 0093-1896. JSTOR 10.1086/498003. Baetens, Jan; Lits, Marc, eds. (2004). La Novellisation: Du film au livre [Novelization: From Film to Novel] (in French). Leuven: Leuven University Press. Larson, Randall D. (1995). Films Into Books. Lanham, MD: Scarecrow Press. Mahlknecht, Johannes (2012). "The Hollywood Novelization: Film as Literature or Literature as Film Promotion?". Poetics Today. 33 (2): 137–168. doi:10.1215/03335372-1586572. Siskind, Mariano (2010). "The Globalization of the Novel and the Novelization of the Global. A Critique of World Literature". Comparative Literature. 62 (4): 336–360. JSTOR 40962923. Van Parys, Thomas (2009). "The Commercial Novelization: Research, History, Differentiation". Literature/Film Quarterly. 37 (4): 305. JSTOR 43797691.